Mitch Albom, The Magic Strings of Frankie Presto. Review. The Magic Strings of Frankie Presto starts off a little slowly as the narrator gets themself established. Considering that the narrator is music itself, this isn’t an easy task but it does make for a little of a slow burn. If anyone can pull it off, it’s Albom whose previous successes give him some leeway. It’s like when JK Rowling spent pages and pages describing all the departments in the Ministry of Magic describing everything. It didn’t progress the storyline but by that point, no one was censoring her. Frankie Presto is a much shorter story than any Harry Potter could be, however. Music, our narrator, is at the funeral of one of its beloved musicians, one of, if not the best one that there has been, Frankie Presto. A Spanish documentary is being made about Presto and the story cuts back and forth from Frankie’s childhood to his end. The book is full of cameos from all sorts of famous people such as Lyle Lovett, Duke Ellington, and Wynton Marsalis who either provide their best story or featuring in Frankie’s progress. With such powerful emotions and dramatic tellings, long-time musician Albom keeps the telling sparse but appropriately wrapped in musical metaphors. It’s a beautifully told story and I read it in one day. Highly recommended. The Tiny Wife is a quirky and rather enchanting, fairy tale cross parable fun little story. In a queue at the bank a flamboyantly dressed man holds up the people behind him and makes them give him something of sentimental value. Things then start happening to them. I will say no more because it is too lovely and fascinating to spoil. I highly recommend it. There is something delightful about the writing which I haven’t found from too many authors. Recipes Every Man Should Know by Brett Cohen and Susan Russo is another of the Quirk pocket books alongside Stuff Every Dad Should Know and Jokes Every Man Should Know. The recipes range from making sandwiches and cocktails to macaroni and cheese and lobster with burnt butter. 1. Preheat oven to 180c. Grease a deep baking dish with butter. 2. Cook pasta until al dente; drain and set aside. 3. Melt butter in a medium saucepan over medium heat. Whisk in flour. Slowly add milk, whisking continuously, until it reaches a boil. Reduce heat and cook 3 to 5 minutes, stirring constantly. Add 1 1/2 cups cheddar, 1 1/2 cups gruyere, salt, and pepper. Whisk until smooth; remove from heat. Add cooked pasta to cheese sauce and toss well. Pour into prepared baking dish and top with remaining 1/2 cup cheddar and 1/2 cup gruyere. 4. Bake until cheese bubbles around edges and top turns golden brown, about 35 to 40 minutes. Unfortunately he failed to find either of the main ingredients: Gruyere cheese or macaroni. The book did not cater for specific supermarket searches so maybe that’s an area they might want to explore for their next edition. There is plenty of information on what utensils and implements to use and there is also some motivation along the lines of ‘cooking helps you get girls’. It’s a fun book and perfectly sized. I may have to update you later on the success of their recipes. I like it. It would make a great gift. Book received for review from Quirk. I reviewed the Politics of Voter Suppression and you can find the article on New Europe. Barack Obama’s reelection to the presidency of the United States was fraught not only with worry about whether he would be chosen by the people or get enough votes in the electoral college but also whether fraud would somehow alter the legitimate results. An electronic voting machine in Perry County, Pennsylvania, selected Romney when the voter chose Obama, automated telephone messages called robo-calls in their thousands told people that the election was on Wednesday rather than Tuesday; people queued for most of the day because manipulation of voting hours meant they were likely to miss out and many states falsely advertised for the requirement of a photo id where none was needed. Many, if not all of the above, were intentional acts of voter suppression. From state to state and from legislation to personal acts of intimidation there have been myriad ways that political parties have suppressed votes throughout the US’ election history. Read more on New Europe . Time travelling books can be a little problematic because if you can travel back in time, you should theoretically be able to avoid lots of problems, fix things to make a better world and then go back to a lovely all-better-present and feel like a hero. As movies like Back to the Future show however, things don’t always work out that way. Stephen King is quite ingenious in the way he makes changing the past a bit more difficult and complicated than with just the power to travel back in time. As with his other novels, this one goes on for a few hundred pages and King puts a lot of effort into his characters There was a bit of a nod towards his usual haunt of Derry, Maine and a rather large nod to It and the clown Pennywise who terrorised the little children – I thought that this was a little self-indulgent but others may find it a bit of a wink to his loyal readers who have stuck around for the last few decades. The one thing that I found a little annoying but which certainly adds to the tension and adrenaline-inducing-fright for which King is famous, is the constant foreshadowing in the book. The story is written in first person narration, post-event so there are many instances of “If only I had known” etc which are just there to get the heart racing and do not offer much else to the plot. I usually think of these tricks as manipulative but they were not too bad. No matter what his weaknesses, King is a masterful storyteller and I was sad to see this story end. He had to be quite creative to find a way to make it problematic to travel back in time but he managed it quite well. A clever and fun read which I enjoyed for quite a while. In case you missed any of the baby posts on the Ephemeral Baby blog I have listed them below. Starting to get a little obsessed with everything becoming some kind of lesson for the baby. Discovering that one size fits all isn’t always true. Choosing Marti Pellow over my child didn’t turn out so well. I don’t watch tv so much but if I did, I would watch Seinfeld. Small little moments of wonder, about time. Lionel Shriver’s eighth novel provides a glimpse of of a single event that can change your life and tracks both stories from that point on. This is a follow-up review to the slightly more vitriolic previous version published a few days ago. I was aiming for a little more balance this time and less anger. 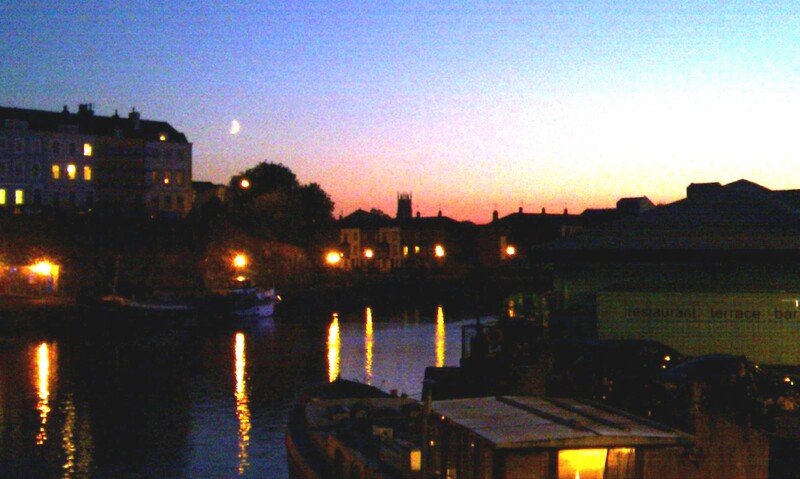 The view from the Severnshed is one of the loveliest in Bristol and it held my gaze for most of the evening although it was mainly the smokers who enjoyed the fresh air on the balcony. The lounge / bar area to the left of the entrance is suffused with warm lighting in a comforting dark wood environment. The restaurant to the right is spacious and has a similar set of doors that look out towards the floating harbour and the houses on Redcliffe. The Severnshed changed owners in March 2010 to the same people who own Coal Grill and Bar at Cabot Circus although apparently the staff stayed in place. 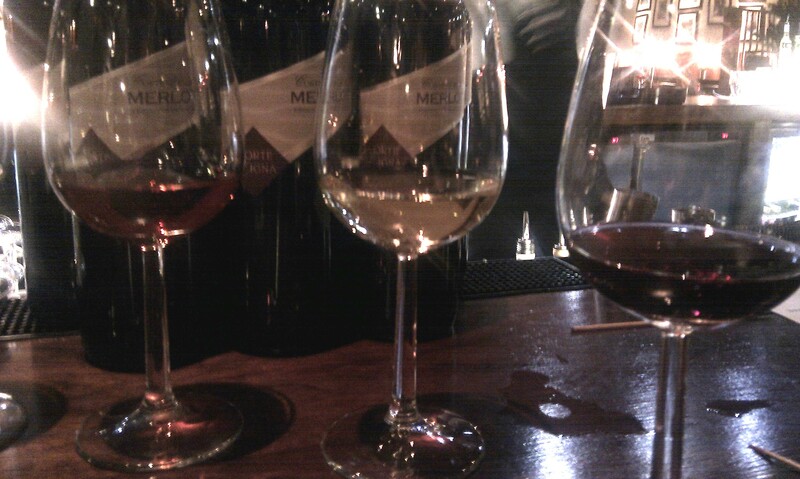 Monday night provided an opportunity to sample the new wine menu and some new dishes. There were four of each and I expect they were either chosen for their differences in order to demonstrate the range of the kitchen or because they were the best of what was available. I’m hoping it was the former. The first combination was lime and chilli king prawn skewers seasoned with just salt and pepper, accompanied by an Australian Riesling. The prawns are on the starter menu for £6.95 and they were quite under seasoned with no hints of citrus or spice. In contrast, the pineapple addition to the skewer was juicy and had a just barbecued, sweetly grilled flavour. The wine, of which I had a taste was pleasant and chilled enough. This was followed by chorizo with garlic oil accompanied paired with a rose cabernet sauvignon tempranillo. The spicy sausage flavoured with paprika was thickly cut, full of flavour and the best dish of the four. The rose had a nice colour and was suitable for the dish. The cost of the dish at the restaurant is £4.50 for a small dish or £11 for three dishes out of a selection. 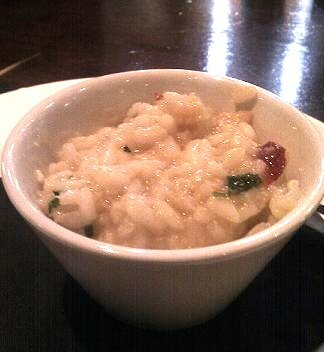 The lobster risotto had an actual piece of lobster which was cooked from fresh. Sadly the dish was slightly under seasoned and the parmesan cheese added a gloopiness to the very well cooked rice which was interesting if not actually useful. I’ve had better risotto so not sure how happy I would have been with the menu price of £11.95 for the slight blandness which was served. The last taste was a dish of beef on skewers in meatball sized portions. I managed one of mine but it took so long to chew that I didn’t bother with the second one. It was served with a more robust merlot red wine which was nice enough and could have been a good choice for a meal. For most people the highlight of the evening seemed to be the service and the cocktail served at the start. For me it was the atmosphere and the view although the latter was slightly marred by the blackboard by the balcony doors which had a list of drink prices. At £4.50 for a pint of Westons Organic Cider it would have made an expensive round for two. This slightly spoiled any thoughts of a future visit although the chorizo promises that there may be some hidden treats on the menu. Despite the waterfront location, seafood was not a winner on this beautiful evening. I walk into the Tobacco Factory and my companion reminds me why I prefer to go for coffee alone. Are you sure you want to go here, he asks. Well obviously I’m sure otherwise I wouldn’t have come in, but my grass-is-greener friend sounds doubtful and out we go again. This time we head to the Lounge, part of the Lounges chains round Bristol. My friend spots an old colleague by the door so we spend some time chatting before we head to the bar to order. I order a second shot with my decaf, soy latte and there’s no green tea so my friend orders a redbush or rooibos tea. The difference in the names is attributed to your accent according to the woman serving us. Not quite a believable statement. She is also apparently the sole one in charge of coffees because when I asked whether they did decaf she replied ‘I do’ so let’s hope she doesn’t drop dead. We hadn’t found a table yet so I went to get one and tell her the number. By the time I got back she’d moved out to collect glasses so I stood around waiting and then half told someone else but by then she was back and with an oh yeah helped out. The coffee and tea were brought out to us quite quickly. All three rooms of the lounge were quite busy and full of young professionals brunching which probably explains why the place smelled of eggs. There was constant movement and talking which social people probably find quite friendly. There were newspapers available although only the sports and travel sections were left or there were the news of the world or the Mirror. The well worn but polished floor boards lent a warmth to the room which suited the autumnal russet colours of the walls. Sturdy wooden tables were well placed with the comfortable armchairs, most fitted with leather cushions. All should have made for a lovely break but somehow it didn’t quite work. The constant smell of everyone’s breakfast pointed to the fact that there too many tables all together. The coffee was bland and even with the additional shot was way too milky. The rooibos tea was the finest a tea bag could provide and didn’t quite live up to the standards of the freshly made Lahloo tea we’d encountered around the city centre and Clifton. Most of the service wasn’t great and I was glad to leave most of my beverage to go elsewhere.